Physical Description: Tall, well built, brunette, good looking. Spit Venom: All Sirians have the ability to spit an acidic neurotoxin which closely resembles rattlesnake venom. This toxin is located in a maxillary gland (like the human parotid gland) and can be "sprayed" by a Sirian voluntarily, when endangered. The 8atomized venom is airborne and irritating to humans, causing dizziness, heart fibrillation and shortness of breath. The range of this weapon is only 1 meter and does 6D STUN damage. Night vision: All Sirians have excellent night sight, allowing them to negate the darkness penalties. However the penalties apply if the Sirians do not wear their "sunglasses" or "visors" during daylight hours. Bred in the hive farms of the military crèche, her Force was decided even before she became a hatchling. From infancy, she was indoctrinated in the methods of survival and fed nutrients designed to stimulate growth and deaden the emotional response centers. The purpose of the program was to breed professional soldiers, individuals who could kill and command. Playtime was just another exercise with hand weapons. After maiming several of her tiny adversaries and killing three, she was promoted to the fifth level, skipping the third and forth because of her demonstrated aptitude for merciless combat. As D'ana grew to childhood, she was educated in the sciences required for work on a spacecraft. She excelled at these, having made up her mind that she wanted to command a Mothership on an invasion foray to a distant world. This had been in the works for some time, and the power and resources expended for this venture were weighted against the number of years remaining to their own world after their rapacious consumption of its resources. Her carnivorous appetite was whetted by the thought of new flesh to sample. After a bitterly contested combat of champions, a new Leader emerged victorious -- the pro-war choice supported by D'ana and her coterie of agents. That his opponent lost via subtle subterfuge was never revealed, even to the Leader himself. For even though a war-monger, he was self-righteous enough to believe his way was the best for the planet's survival. Work on the fleet commenced at an accelerated pace along with fifth column activities on Earth and intelligence-gathering on the human way of life. Various samples of Homo sapiens were secretly kidnapped and brought back for careful scanning and vivisection to develop artificial human skin which would pass muster among humans. Even after the fleet was completed, the final stages of the human-like skin covers had to be perfected. They wanted to take the planet quickly and quietly so as not to expend any more of their own planet's dwindling resources than necessary. They spent the journey to Earth applying and getting used to their human disguises, even to the point of wearing them while making love to make sure there would be no disintegration under close bodily contact. Such sacrifices in dealing with a sub-species had been deemed necessary in order to properly infiltrate the race. D'ana, while having worked her way up to a position of authority, was still subject to the wishes and whims of the supreme commander of the fleet, a female who had not been part of the old crèche program and to whom the military was a job that carried great social prestige. D'ana hated her, and coveted the highest goal of her indoctrinated life. As the armada neared Earth, it was D'ana who suggested that it would further the bond of trust was they to turn their alien names into closely approximate human equivalents, an idea warmly received. The contact and subterfuge worked well, but D'ana (now Diana) did not reckon with the wiles of human nature, or that someone like Mike Donovan, whose job it was to uncover truth where only suspicions lay, lurked among them. As reprisal, Diana had Donovan's son kidnapped while other Visitor personnel tricked Donovan's mother into supporting their efforts in return for favors. 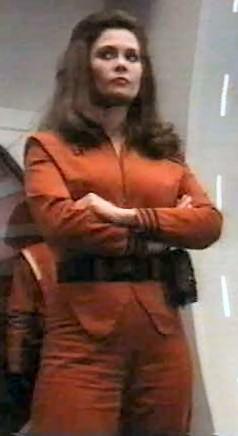 But Diana continued to clash with her own commander. When the resistance released the red dust which shattered the invasion, Diana took the opportunity to slay her superior and assume the position for her. But her hegemony was short-lived. Setting the mothership to self-destruct, she escaped in a landing craft only to be pursued by Donovan and captured on the ground. A year later, while being tried for crimes against humanity, she escaped through the nefarious machinations of Nathan Bates and his hired gun, Ham Tyler. She knew that Bates wanted her to reveal the secrets of the captured mothership, and she intended to give him trivial information until she was in a position to steal the powerful vessel back. But Martin stepped in to alter her plans, much to her advantage. Martin belonged to a political affiliation on the Visitor homeworld which supported the previous ruler, the one the current Leader defeated. This group, which had a large measure of support, was ethically opposed to genocide and did not believe in the ethnocentricity that presupposed that the Visitors were automatically superior to any alien race that lacked the weapons to defeat them. But after the Leader came to power, such views became politically unwise to express, and in some quarters were viewed as treasonous. When Martin managed to come face-to-face with Diana, his only thought was to slay her. Unfortunately, he only succeeded in allowing her to escape and mortally wound him in the process. She managed to reach a control center where she was able to contact the waiting fleet, which rescued her. On board the mother ship, she renewed her war against humanity, resisting even the Leader's final call for negotiations. Warfare had been in her blood too long and humans, particularly Donovan and his resistance friends, had become bitter personal enemies. But Diana went too far when she plotted to have the Leader assassinated and place the blame on the human rebels. The plot was uncovered and she found herself under arrest and a prisoner of her own people. What the future holds for her only her cunning ruthlessness may determine, but when last seen she had been declared an enemy of her own race.